Grilled cabbage may sound a bit odd to people. Really odd to some. Yet we can assure you that this grilled napa cabbage is as delicious as any other grilled vegetable. After just a bit of time over a hot flame, cabbage takes on a lovely sweetness, picks up crispy blackened edges, and gets slightly softened while stubbornly holding onto its crunchy texture. Heat a gas or charcoal grill to high heat (you should be able to hold our hand about an inch over the cooking grate for just 1 to 2 seconds before pulling it away from the heat). While the grill heats, trim the cabbage, removing any damaged outer leaves and cutting off any browned or excess stem still attached to the head, but leaving the center core intact. Cut the cabbage into 8 wedges, being careful to keep a bit of the core in each cabbage wedge to hold the wedge of leaves together. For ease of handling, and to make sure the leaves don't fall apart and into the flames once they're on the grill, skewer each cabbage wedge onto a grill-proof skewer. Brush the cabbage wedges lightly with olive oil and sprinkle them with salt. 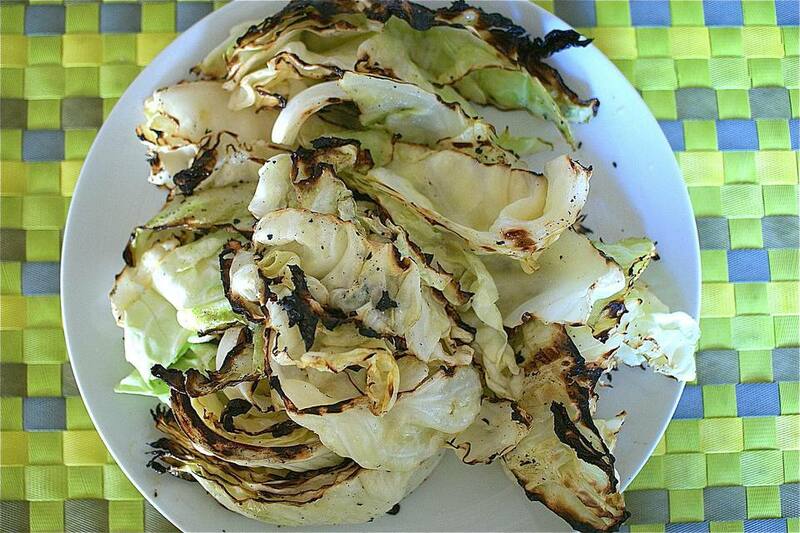 Set the skewered cabbage wedges on the hot grill and cook until the edges are blackened and crispy and center of the cabbage wedges are warm, turning to color all sides, 10 to 15 minutes. For more tender cabbage, cover the grill while they cook. Serve the grilled cabbage hot, warm, or at room temperature. You can let people un-skewer their own cabbages if you like, but I find it's a bit more kind to take the hot skewers out for people! Remove the wedges from the skewers and chop it all up before serving it more as a salad, drizzling it with a vinaigrette. Sprinkle with grated cheese while the grilled cabbage is still hot so the cheese melts into it a bit—aged Gouda or cheddar are both really nice choices for this. Drizzle with flavored oil before serving; lemon olive oil is nice, but a hot chile oil or toasted sesame oil add even more kick. Add a sprinkle of ground cumin or other earthy spice (the warm spice mix called garam masala is a good choice, too) to the oil you use to brush the cabbage in step 3.